DEAR GARY: This task is not as challenging as it might seem. You are very lucky that you discovered the flaw in the subflooring before you started the installation of the finished wood. All too often, I have seen professionally installed hardwood floors that have dips, humps and other inconsistencies in them. When I see these imperfections on the finished high-gloss surface, I know a rookie must have installed the actual flooring. CLICK HERE to get FREE & FAST BIDS from local hardwood installers. There are wood subfloors that are very hardwood-friendly. This means the subfloors themselves are flat and smooth. Flat and smooth doesn't mean that the floor is level. A floor doesn't have to be perfectly level to look superb covered with hardwood strips. Wood floor systems framed with engineered wood I joists, or those made from floor trusses, often are extremely flat or in the same plane. I've worked with both types of joists and they're a dream because they produce such a flat floor. Those wood floors framed with traditional solid-wood joists are the ones that can cause problems. Each joist may be slightly different in height and, to compound problems, each joist can have a different degree of crown. The crown in a wood floor joist refers to the amount of upward curvature that exists in the framing member as you look down the length of the top edge. If the rough carpenters and lumber suppliers are very selective about the floor joists they use, a traditional wood joist system can be as perfect as a wood I-joist or floor truss system. But this is a RARITY. What's more, modern framing lumber has been hybridized so it grows faster. To me it seems modern lumber has more crown to it than lumber I used forty years ago. The best joists are ones with vertical grain. A vertical-grain joist is one cut from the center of the tree. It would have the small dark round center of the tree in it and the growth bands radiate out on each side until you get each end of the joist. A flat-grained joist is one that's cut from, or near the edge of the tree. To get your wood subfloor ready, the first thing to do is to make sure the wood sheathing that is on top of the joists is securely fastened. I highly recommend installing coarse-threaded screws in addition to the nails that might already be in place. Be sure to do this in high foot-traffic areas of the room. The use of screws will prevent floor squeaks that are caused by nails that are not driven completely or that work themselves loose because of lumber shrinkage. Use screws that penetrate at least one and one quarter inch into the wood joist. After the subflooring is screwed tightly to the joists, vacuum the floor to remove all dust and debris. Use a six-foot long straight edge and a level to find the highest spot on the floor. Although you might want the floor to end up in the same plane, it may not be a realistic goal. Your existing floor may be severely crowned. If this is the case, the hardwood floor may need a giant wedge of shims or leveling compound that extends to one or more walls in the room. This degree of correction may not be needed to get the visual goal you desire. I always use regular roofing shingles to fill in any dips or depressions in wood or concrete subfloors. The overall floor may not end up in the same plane, but if you have just one gentle hump that extends over 10 or 12 feet, the naked eye can rarely detect this imperfection. Dips or depressions in a subfloor are immediately identified using the six-foot long straightedge. Place it at the highest spot in the floor and slowly swing it around in a 360 degree circle. The low spots will be readily visible under the straightedge. You can see all imperfections best in a darkened room. Use a flashlight held parallel with the floor and aim the beam at the straightedge. Believe me, you'll see gaps beneath the straightedge. Use a marking crayon to outline the hollow spots and mark how deep they are. Use as many asphalt shingles as necessary to fill the low spots. They do not have to be nailed down as the many nails used to hold the flooring in place will pass through the shingles as they are driven into the wood subfloor. You can tack the shingles in place if you desire so they do not move around as you work on the floor. The use of a floor leveling compound can achieve the same goal, however it requires a bit of skill to apply the compound evenly. Also, if you mix some leveling compounds wrong by adding too much water, there is a possibility they can break down over time and turn to powder. These compounds work great if you follow the instructions. Always mix a TEST batch and see how it works. This is a cheap insurance policy. You want to make sure it flows and looks superb. You want to know how THIN you can get the self-leveling compound. Some are not recommended for thin hollow spots. READ the label to find out the limitations of the compound you decide to use. This will not happen with shingles, which is exactly why they are my weapon of choice when confronted with this task. But shingles can be hard to work with and they don't fill the entire hollow spot. There's pros and cons with each method. 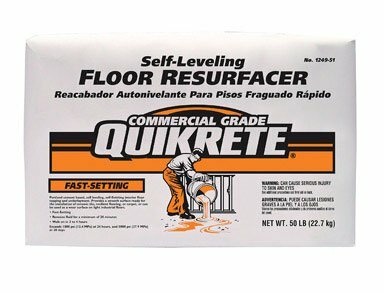 This is a great name-brand self-leveling floor compound. You just mix it with water and pour. CLICK THE IMAGE NOW TO ORDER IT. If you fail to fill the depressions under a hardwood floor, the hardwood can flex when you walk over it. Over time, this can cause squeaks as the hardwood slides up and down the nail shafts of the nails used to install the hardwood. The subfloor doesn't have to be absolutely in the same plane to prevent squeaks, but voids of 1/8 inch or more can cause problems. In thinner hardwood, the actual interlocking tongues can crack off if the hollow spot is too big. This is a massive problem and is why you must have the floor FLAT. Installing hardwood flooring perpendicular to the direction of the floor joists is also critical. Finished flooring that runs parallel to the joist direction will often telegraph the slightest defects in the subflooring. Be sure to install tar paper over both wood and concrete subfloors to minimize moisture infiltration to the underside of hardwood flooring. Tar paper is an excellent vapor retarder. Floor trusses I used to cover a 24 foot span for the down and upstairs family rooms sagged about 1 and 3 fourth inces in the middle leaving a bow shape in the upstairs 20 x 24 room floor of tongue and groove. Levelers are far too costly that I have priced at building supply stores. Will roofing tiles help to solve this type problem? is it too noisy to install woodflooring on an upstairs living room? If people walk across it with hard heels you'll hear the clopping! Can you use this method for a floating floor like laminate? Would you just staple the 30# down to the plywood subfloor in that case? Would you need to lay something on top of the shingles/30# (like 1/4" plywood) to keep them from "kissing" in warm weather? Wouldn't putting asphalt shingles in between the subfloor and the hardwood eventually smell?? No. I've never been able to detect any hydrocarbon odor. Nor any of my paying customers. Hi Tim - thank you for the great suggestion. I too am installing 3/4 inch oak and have some dips and especially some slopes in the osb subflooring. I am in the process of starting to use the asphalt shingles, in some areas i actually had to go 3-4 high. My question is regarding the sound of the shingles. After tacking them in place, I get a very load crunchy sound from the shingles. I am very worried that i will hear this after installing the floor. How did you avoid this when using the shingles? Also, do you recommend they be installed on top of or under the roofing paper? Thank you. When using shingles, are you at all concerned the flooring nails won't hold as well, especially in some of the deeper voids? $7,000 to lay down plywood and level as a fix for my floor that's warped with peaks and valleys? Too much? 1400 sq ft.
House has joists going the wrong way I'm told; and support is only one row of posts across middle of basement, which are pushing the center up and the rest of the floor slopes away from there. It's impossible for me to give you an answer without seeing the job. There are just so many variables. Get a MINIMUM of three quotes. I'm installing 3/4" oak hardwood in kitchen and living room to match dining room but the wood in dining room was laid directly on 3/4" plywood subfloor and Kitchrn and living room Vynel/carpet was laid on top of 1/2" particle board that was glued on top of the 3/4" plywood. Wood flooring contractor told me to remove the particle board so the new floor was installed direct on top of 3/4" plywood because that's the best Israel and there will be no transitions. I spent three days removing the particle board but still have glue in many places that I need to sand down and more concerning I have many places where the plywood splintered (sometimes for four feet and up to 1/4") when I was pulling up the particle board. Now I'm wondering what I should do? Any help or similar experience would be greatly appreciated. I think you need to follow the instructions of the installer. I wouldn't want transitions or trippers as I used to call them. I'm putting stapled 5" wide 1/2 engineered acacia over 3/4" OSB on top of 2x6 T&G cardecking. The floor is flat enough but I've discovered a consistent and abrupt slope along the back wall of the house because of settling. It would be a low traffic area, generally under furniture. If I leave this little wowie, what are the long term risks? Is it just about aesthetics, or am I setting myself up for trouble if I don't adjust for it? The easiest correction would be to put some shingling on top of the subfloor, under the underlayment and hardwood, but I'm freaked out about whether the shingling will cause more harm that good because it's still an abrupt edge under the hardwood planks, whereas the slope is a continuous plane. The harder correction would be to pull up that section of subfloor and use the shingling there to ease the slope at that edge, but as I'm at the tail end of the project, and it's again, not a high traffic area, I wonder if I'm fretting over nothing. Awesome idea - glad I searched around before trying to shim the floor. Same question as another person - do you install the tar paper under or over the shingles? Seems like under makes the most sense. I am getting ready to install a 3/8" engineered bamboo floor in my kitchen and living room. This will be a 3/8" click lock floating floor with a foam underlayment on the subfloor. Whent he house was built in 1977, they used 1/2 plywood with a layer of 1/2" particle board on top of it. We have successfully removed everything down to the 1/2" plywood subfloor. I am working on screwing down all of the seams to eliminate squeaks at the moment. My plan is to put 1/2" osb on top and lay my new floor on this. Although my floor does not have any huge dips or peaks, there are still some gaps larger than 1/8" (mostly sags between the floor joists). Should I try to use leveling compound on the floor before I add the osb on top or should I wait and try to level it on the top of the osb? I'm in a similar situation. House built 1979 with 5/8" plywood subfloor. I corrected for flatness up to 1/16" using tar paper, but the subfloor flexes too much and the bamboo floor's locking mechanism makes a noise like rice crispies when you walk on it. The plan is to add another layer of 1/2" plywood, but I'm worried if I don't flatten the subfloor before laying it that the new plywood will have the same unevenness. We installed laminate on tile over concrete floor. The floor was level, but the step that goes downstairs dips a bit on the end (about three inches from the tip of the step almost straight across with a depth of about 1/4"). What is best to bring this small portion level with the rest of the floor? Will the shingles work or is that too unstable for the end of a step? We have new construction and one part of the hardwood flooring over the main support beam has separated at the seams and is not level with the rest of the floor. The flooring has been discontinued. Is there any way to repair this without taking up the entire floor and leveling the sub floor? Great information. I live in a 130 year old Victorian House. Planning to put new finished flooring in downstairs and hall. You provided the correct way to accomplish this. We cannot do it ourselves. But now I have an idea of what to ask a contractor (licensed) when they visit. Home Depot in Canada apparently does not do what you suggested, just not cost effective I guess. 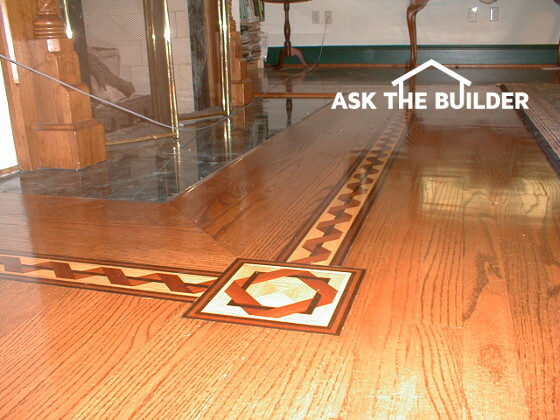 Our semi Victorian House is only 12 feet wide, and the flooring area is about 24 feet long. Hi, I have the same problems that everyone has posted here except that my repair is preceding a porcelain tile job and I'm wondering if that should cause concern relative to using asphalt shingles since the tiles unlike oak flooring, don't provide much rigidity themselves. I was considering up to about 19" square tiles. The shingles would be filling up to about 5/8" in places. Thanks. I am wondering if the asphalt shingles will crush after some number of years. Have you seen them hold up longer than five years? Thank you for any help. I am taking out 12" tiles in the kitchen and putting down hardwood in the whole house. How clean and smooth does the plywood underneath need to be before the underlayment is put down? Will it correct for slight imperfections? The tile had been put down on to of plywood which is at the same level as existing hardwood in the remainder of the house that cannot be resurfaced. I am hesitant to remove and replace the plywood. I am about to rip up Berber carpet and pad in my living room and dining room... underneath is tongue and groove flooring that is 99 years old. The old tongue and groove flooring has the dips here and there, yet when walking on the carpet, you don't feel any of them. I want to go over the old flooring with new click wood flooring. Should I apply the asphalt shingles to the old flooring? What about planing the rough cut joists that are under my bathroom floor? The house was built in'54 and looking at the bathroom door, it looks like the right side is 3/8-1/2" lower than the left.